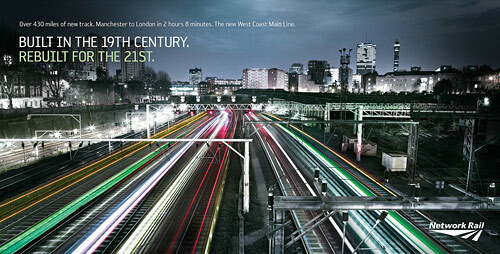 The Network Rail Campaign I shot in April is now live! The print and posters are all over the UK at the moment and some locations like Euston Station have used state of the art digital posters. The idea is to inform the British public (deprived for years of a fully operational rail service) of the massive job Network Rail have done improving the West Coast Main Line from Euston to Glasgow. We ended up shooting the viaduct up in Cumbria, the night shot in Camden and if that wasn't glamorous enough we then shot the platform at Rugby Station. Once again it was a pleasure to work with the fantastic Angus and Nick at Locate Productions and also ace Art Director Toby Burnett for Iris London. To check out the three poster campaign in more detail go to the New Work section on my site.